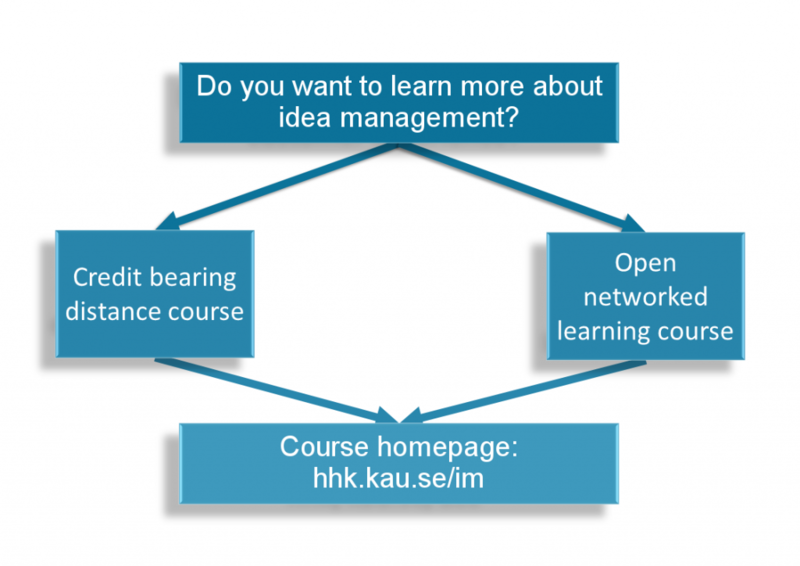 Idea management is offered in two different versions, running at the same time. It is offered as an “official” credit bearing distance course and as an open networked learning course. This course is part of Karlstad University’s regular course catalogue. Participants need to apply through University Admissions (antagningen.se for the Swedish version) and have to fulfill certain requirements, such as several years of business experience. There are limited places available in the course and upon successful completion, participants will receive 6 credits. More information can be found on the official course homepage on www.kau.se. In this version, no prerequisites or requirements have to be met. The course is open to everyone and you can even join the course after it has started. Participants have access to all the learning resources and activities of the course, but will not be examined by teaching staff of Karlstad University and will therefore not receive any credits. Participants in both versions of the course will interact during the course and take part in the same learning activities, such as commenting on each others ideas, participating in webinars and discuss on the course homepage.